Tickets now on sale for 2017/18 winter season! Tickets are now on sale for the South East’s most beautiful winter ice rink, the Royal Pavilion Ice Rink, opening for its eighth year from 4th November 2017 to 14th January 2018. The ice skating tickets go on sale just two weeks after ITV announced that its hit show, ‘Dancing on Ice’, is returning to our screens in early 2018 for the first time since 2014 – inspiring visitors to the rink to channel their inner Torvill and Dean. 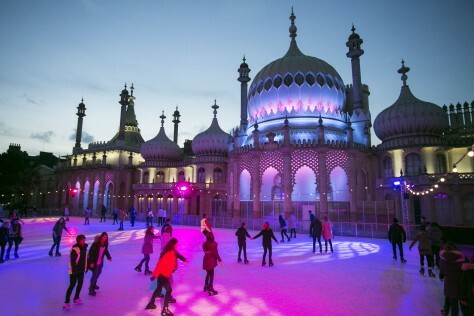 “We are looking forward to welcoming visitors back to our enchanting rink this year and hope that everyone will take advantage of this unique seasonal opportunity to enjoy the ice and to see Brighton at its twinkling best,” said Shella Parkin, MD of Laine Ltd, creator of the Royal Pavilion Ice Rink. The Royal Pavilion Ice Rink is located within Brighton’s bustling North Laine district, perfect for Christmas shopping, and beautifully lit at night for a truly magical Christmas skate right in front of the former royal pleasure palace. The 880-square metre main rink offers plenty of space for more confident skaters and the unusual, separate 130-square metre beginners’ rink with penguin skate aids provides a safe area for younger skaters to build their confidence. For those looking to just sit back and soak up the festive atmosphere, there’s no charge for spectating from the cozy rink-side Bar & Kitchen or on its 40-metre terrace next to the ice. With plenty of space for larger gatherings, the 130 seater restaurant offers sumptuous snacks, hearty meals, including stone baked pizzas – new this year, a fantastic after school menu for kids and a great bar selection including local ale and a new range of craft beers, 14 different gins, and mulled wine or cider. Conveniently situated just 50 minutes from Victoria by train, all of Brighton’s gorgeous independent shops are on its doorstep so visitors can get a little Christmas shopping in too.